When it comes to feel-good stories in the NHL this season, you’d be hard-pressed to find one better than New York Rangers defenseman Stu Bickel, who began the season playing on Asylum Street in Hartford. 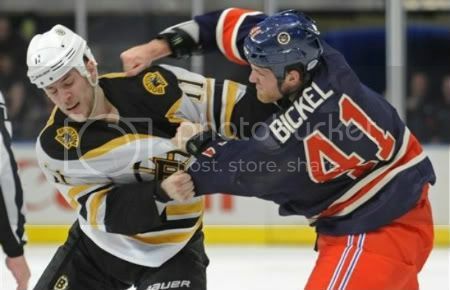 Though Bickel will never be confused with elusive Hall of Famers Bobby Orr or Cheshire-bred Brian Leetch, he has proven to be one of the NHL’s all-time steals since being acquired from the Anaheim Ducks on Nov. 23, 2010 for disgruntled Hartford Wolf Pack defenseman Nigel Williams. While Williams, a second-round pick of the Colorado Avalanche in 2006, is out of hockey, Bickel is earning almost nightly rave reviews for his grit and perseverance while paired with another former Wolf Pack defenseman and NHL All-Star Marc Staal. Bickel had one goal, three assists and 80 penalty minutes in 27 games with the Connecticut Whale before being called up Dec. 18 after former Wolf Pack defenseman Michael Sauer sustained a concussion and Steve Eminger separated his right shoulder. After being considered little more than an enforcer when he joined the Rangers (44-18-7), the 6-foot-4, 220-pound Bickel had four assists in his first three NHL games, matching his point total with the Whale. Now, with former Whale Michael Del Zotto sidelined with a hip injury, Bickel is part of the Rangers’ No. 2 defensive pairing behind two more former Wolf Pack/Whale defensemen, Dan Girardi and Ryan McDonagh. Bickel, 25, has eight assists and 83 penalty minutes with nine fighting majors after eight with the Whale. He also played six games at right wing when Ruslan Fedotenko was injured in mid-February and is plus-8, including plus-2 in a 4-2 victory over the Carolina Hurricanes on Tuesday night. Speedy left wing Carl Hagelin, another major contributor since he and forward John Mitchell were called up Nov. 24, had a goal and two assists while on the No. 1 line with Brad Richards (two goals, one assist) and Marian Gaborik (one goal, two assists). The trio was a combined plus-11 and named the game’s top three stars: 1. Richards, 2. Hagelin, 3. Gaborik. To continue reading, click on the read more button below if you’re on the home page. Rangers coach John Tortorella has said he has “never fallen in love with (Rangers captain and former Wolf Pack wing Ryan Callahan) and Richards playing together.” But now he has a line that didn’t jell early in the season coming together since he reunited Richards and Gaborik on a line with Hagelin for parts of games in Chicago on Friday and against the New York Islanders on Sunday. Tortorella then lauded Whale coach Ken Gernander and assistants J.J. Daigneault and Pat Boller. Hagelin received the celebratory Broadway Hat after finishing with career highs in points and plus-minus (plus-4), along with five shots, second to Gaborik’s six, while logging 19:32 of ice time at even strength and on the penalty kill. Hagelin has 13 goals, 20 assists and is plus-23 in 51 games with the Rangers after getting seven goals and six assists and being a team-best plus-12 in 17 games with the Whale. His plus-23 with the Rangers is tied for second on the team with McDonagh, one behind Del Zotto. Hagelin had some pedigree as a sixth-round pick in 2006 who starred for four years at the University of Michigan and co-captained the Wolverines to the NCAA title game in 2011 before joining the Whale for the playoffs. Bickel, meanwhile, was undrafted and looked it at times when he first joined the Rangers. But now as he continues to clear the crease and help protect his teammates, his positioning and puck movement is simple but effective as his ice time has increased. Tuesday night he played a career-high 21:54, the fifth time in six games he reached at least 16 minutes. Bickel, who earns $600,000, second lowest on the Rangers to newly acquired enforcer John Scott’s $512,500, was needed in a major way after the injuries to Sauer and Eminger occurred before Staal returned from post-concussion syndrome for the 2012 Winter Classic in Philadelphia on Jan. 2. Rookie Tim Erixon, back with the Whale, Anton Stralman and Jeff Woywitka, who spent a two-week conditioning stint in Hartford in February, helped the Rangers weather the injury storm, but Bickel was the biggest new asset in size and contributions. “We watched him in camp, he had a really good camp,” Tortorella said. “He understands being simple and staying within himself. What catches your eye about him to give him an opportunity to stay here a few more games is his willingness. That’s part of his game. It’s just like when a player comes up, can he handle the defensive part where it doesn’t hurt and it’s in the back of your net? When asked what the biggest factor has been in Bickel’s improvement, Tortorella didn’t hesitate. “It’s him,” Tortorella said. “I’m sure he watches. Sometimes when a player is playing real well, everybody is looking to give credit all over the place. Give the player credit. Like (center) Brian Boyle last year, he had a total different mindset coming into camp. I remember talking to Bic earlier this year, to him it’s not a surprise that he’s playing in the NHL, that’s how he feels about himself. It’s reminiscent of what Girardi did six years ago. He also was a free-agent signing and began his pro career with the ECHL’s Charlotte Checkers before joining the Wolf Pack during his first season and the Rangers in his second. On July 9, 2010, he signed a four-year, $13.3 million contract and was an All-Star for the first time this season. It might be a bit much to expect such a repeat by the usually upbeat Bickel, who often tries to downplay his play. Tortorella also liked the progress of wing Mats Zuccarello, who played his second game after being called up from the Whale on Sunday to fill in for Callahan, out with a sore right foot from blocking a shot. Zuccarello, mobbed by fans outside MSG before the game, didn’t have a point as he did in a 4-3 overtime victory over the Islanders but got more ice time (12:03), especially at even strength (8:44), where Tortorella had said he wanted to try to play Zuccarello more. Zuccarello and the rest of the Rangers will have to be on top of their game Thursday night when the red-hot Pittsburgh Penguins come to Madison Square Garden in the latest return of superstar center Sidney Crosby from post-concussion symptoms that have plagued him since he was hit hard in successive games in early January, 2011. Center Evgeni Malkin has filled the void left by Crosby, who has two goals and eight assists in only eight games. Malkin’s league-high 84 points have helped make him the leading candidate for the Hart Trophy as NHL MVP. Crosby had two goals and two assists in a 5-1 victory over the Islanders in his first return Nov. 21. He admitted he was energized and motivated before that game, saying later, “I could have played all night.” But this time he’s coming back to a team in a tight playoff race, with every shift possibly proving crucial. Crosby said conditioning isn’t an issue; he pushed himself hard while skating for weeks before returning to practice last week. Crosby announced Tuesday that he was coming back after working with rugged wings Matt Cooke and Tyler Kennedy on the third line. Coach Dan Bylsma kept his top two lines of Chris Kunitz-Malkin-James Neal and Steve Sullivan-Jordan Staal-Pascal Dupuis together, though that’s always subject to change. Crosby is also expected to see time with Staal and Malkin, though the Penguins’ three centers have been together for only 10 games in the last two seasons. While Crosby has played frequently with Malkin, especially in situations where the Penguins needed a late goal, he has not played with Staal. Crosby is scheduled to play 14-15 minutes a game, though Bylsma knows it will be difficult to limit his star center to that amount of time. Bylsma said Crosby’s exceptional vision and puck-moving ability is “the best we have on the team.” Crosby, long known as “the Kid,” is becoming the Penguins’ Comeback Kid, a distinction he doesn’t really want. “I don’t want to have to go through this again,” he said. Crosby has been an elite player since joining the NHL at 18 with a 102-point season in 2005-06. He won the MVP award, a scoring title, the Stanley Cup and an Olympic gold medal by 22 and was putting up the best numbers of his career with 32 goals and 66 points in 41 games until he developed the concussion. It was the remaining symptoms from that concussion, including headaches and motion issues, that kept him out of the first 20 games this season. While he was out, Crosby met with specialists other than those treating him in Pittsburgh, and a soft tissue injury in his neck was discovered. Crosby believes the diagnosis and subsequent treatment helped him return before the end of the season. He was symptom free when cleared to resume contact work in practice on March 6 and has stayed that way. Unless he misses any more games, Crosby will get in 14 before the playoffs, including six against the Rangers, Philadelphia Flyers and defending Stanley Cup champion Boston Bruins, who have struggled the last few weeks. That was especially true Tuesday night, when Steven Stamkos, the first overall pick in 2008, scored his 49th and 50th goals of the season and former Wolf Pack wing Tom Pyatt and Darien native Ryan Shannon each tallied once as the Tampa Bay Lightning routed the Bruins, 6-1. “We’ll make sure I get better every game, but I’ll pace myself a bit with the schedule,” Crosby said. The Rangers are six points ahead of the Penguins in the Atlantic Division and Eastern Conference and have won six in a row at MSG, where they are 24-7-2, their best record at home through 33 games since going 23-6-4 in 1993-94, when they won their last Stanley Cup to end a 54-year drought. After Tuesday night’s game, the Rangers reassigned goalie Chad Johnson to the Whale after he was called up on an emergency basis earlier in the day to back up Martin Biron (27 saves) because Henrik Lundqvist had the flu. Biron didn’t learn he was starting until he was having lunch with his wife around 1 p.m. after a long morning skate with the extras, as well as being the only goalie for the optional. “Hank came through for me in the Winnipeg game when I got sick, and he probably found out about the same time, right at lunch time, so I had to return the favor and it worked out pretty good,” Biron said. Former Wolf Pack defenseman Bobby Sanguinetti, a New Jersey native, fittingly made his Hurricanes debut after being the Rangers’ first-round pick (21st overall) in 2006. Sanguinetti was scoreless in five games with the Rangers and had 15 goals and 69 assists in 160 games and was a two-time All-Star with the Wolf Pack before being traded to the Hurricanes for a 2011 second-round pick on June 26, 2010. He has 11 goals and 39 assists in 80 games with the Charlotte Checkers, including eight goals and 27 assists in 49 games this season before being called up. He was scoreless and minus-1 in 9:39 on Tuesday night. … Center Keith Aucoin, the AHL’s runaway scoring leader when called up from the Hershey Bears, had three assists, including on Alexander Ovechkin’s two goals, to help the surging Washington Capitals rally for a 5-4 shootout victory over the Islanders on Tuesday night. Ovechkin tipped in Aucoin’s shot at 10:15 of the third as the Caps scored the last three goals to get to overtime. Ovechkin and Matt Hendricks then beat Evgeni Nabokov in the shootout to give the Caps a fourth consecutive victory in their late bid to earn a playoff spot. … Former Wolf Pack center Jeff Taffe had a goal and three assists, including on South Windsor native and captain Jon DiSalvatore’s team-high 25th goal, as the Houston Aeros beat the Abbotsford Heat 4-1 on Tuesday night. The Whale and Bridgeport Sound Tigers, tied for the Northeast Division lead, renew their spirited rivalry Friday night at the XL Center in the start of the Whale’s five-game homestand. It will be the ninth of 10 meetings in the GEICO Connecticut Cup series in which the Sound Tigers are 5-1-1-1, though three of their wins have come in overtime or a shootout. The Sound Tigers (32-20-3-5) were in the division basement after a 2-10-0-1 slide from Thanksgiving to the end of 2011, but a stunning 20-2-0-2 run vaulted them into first place before they lost three straight last weekend for the first time this season, the first two via shootouts, starting against the Whale. The Whale (31-20-5-5) had a six-point division lead entering 2012 before an 11-game winless streak (0-6-3-2) in January dropped them behind the Sound Tigers. But the Whale has rallied with a 12-4-1-0 run to tie the Sound Tigers, who have a game in hand and own the first tie-breaker, which is most non-shootout wins (28-25). The Whale also hosts the Springfield Falcons on Saturday night and the Portland Pirates on Sunday afternoon. … Falcons fans will go for a series sweep in their seventh and final meeting with their Whale counterparts on Saturday at 4 p.m. at the XL Center. Tickets ($16) and more information are available at facebook.com/whalefalconsfangame. The series was originated by Seth Dussault of Easthampton, Mass. Matt Marychuk of Glastonbury created a Facebook page to see if there were any interested players, and he and Dussault managed the social media page as interest grew. They used the page to sign up fans to play and communicate between the players and managed to fill rosters for each fan team. The idea caught the attention of the Falcons and then Whale front office, leading to players of all ages and skill levels participating in the series. A portion of ticket sales benefits Defending the Blue Line, an organization that helps children of military families play hockey. The first five games raised $850 for DBL. … College students can get discounted Whale tickets to weekday games with a “Ditch the Dorms” deal. For Monday through Friday games, students who show a valid student ID at the Public Power Ticket office can get $2 off upper-level tickets and $5 off lower-level seats. … Fans can bid on AHL All-Star Classic jerseys, helmets, gloves and pucks at www.theahl.com. Zuccarello and rookies Jonathan Audy-Marchessault of the Whale and Greenwich native Cam Atkinson of the Falcons were on the Eastern Conference team, which was captained by former Wolf Pack left wing and Hershey captain Boyd Kane. University of Connecticut sophomore forward Cole Schneider has signed a two-way contract with the Ottawa Senators and will start his pro career with the defending Calder Cup champion Binghamton Senators. Schneider, 21, of Williamsville, N.Y., turned pro after the Huskies finished the season 16-19-4, losing 2-1 to Air Force in the Atlantic Hockey Association quarterfinals best-of-3 series last weekend in Colorado Springs, Colo. He set the UConn Division I points (45) and goals-scoring (23) records this season after setting freshman records with 20 assists and 30 points and was named to the AHA All-Rookie team. In two seasons with the Huskies, he had more points (78) than any sophomore since UConn became a Division I program in 1998. The 6-foot-2, 185-pound Schneider will join the Senators next week on a deal in which his salary is based on whether he plays in the AHL or NHL. The Senators have the AHL’s worst record (24-34-2-2) and are 18 points out of a playoff berth with only 14 games left. After this weekend, they have 11 games, and Schneider could make his pro debut next Wednesday at home against the Sound Tigers. “Cole has worked hard to put himself in this position,” UConn coach Bruce Marshall said. “He had a tremendous impact on our season and our success. We’re excited for the next opportunity that’s in front of him. We’re looking forward to following his continued success down the road.